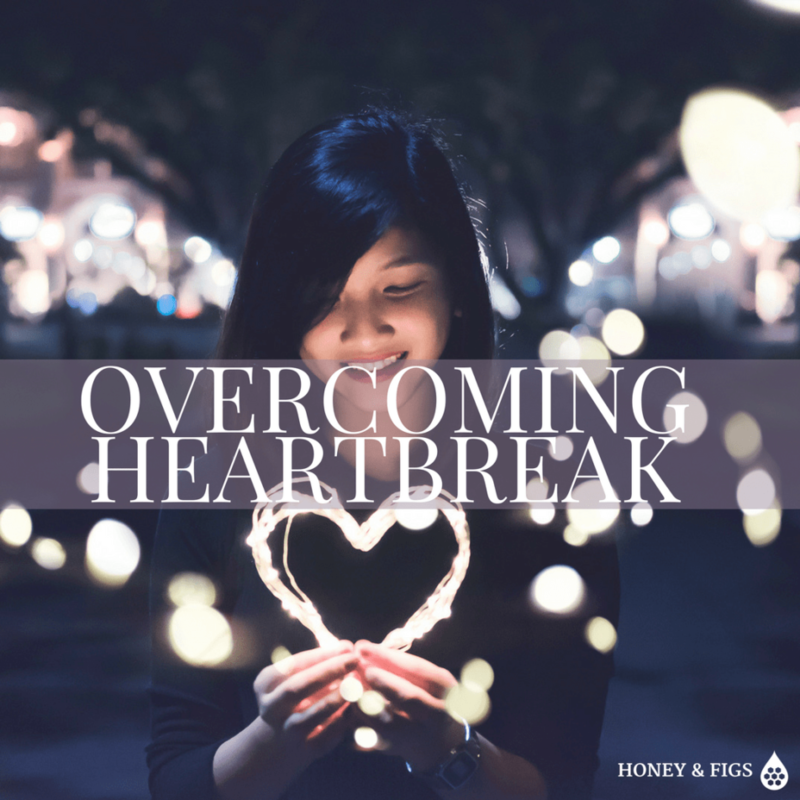 It has been many years since I experienced the pain of a broken heart, but I have known it well and have experienced it so intensely that I thought I would document the way I overcame it so that it might help you know that you are loved and most of all that you will be ok.
First, let me say that I am so thankful today that my breakup occurred when it did. Had I stayed in that dysfunctional relationship, even if it ultimately led to marriage, it would have been a tragic failure. Yet, here I stand today with the most amazing husband, the two of us happily still in love 14 years into our marriage because God had a plan for my mate and he has a plan for yours too. 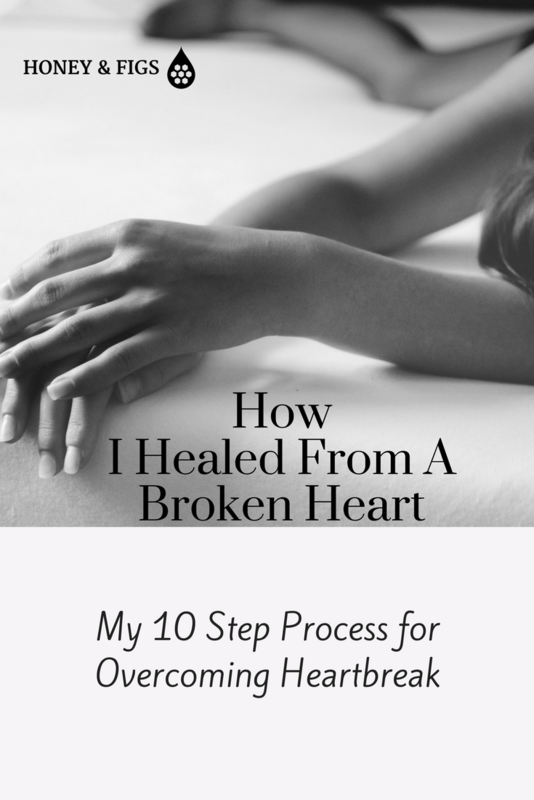 Below is my personal journey through the pain of a broken heart after a 5- year relationship in my late teens and early twenties ended in infidelity. I had stayed in that relationship for far too long, ignoring all of the warning signs, comfortable telling myself things like “he may not be Mr. Right, but he’s Mr. Right Now”. I was a complete fool. If I were to have been honest with myself, the real reason I stayed in a bad relationship for so long was that I didn’t want to be wrong. I didn’t want to face that fact that I had chosen poorly. That I had wasted my time. When the truth finally came out, I discovered that the man I had been dating (we’ll call him Mr. X) was leading a double life with another girl, had lied to me about everything, including the college he went to and had gotten yet a third girl pregnant. I could no longer look the other way. That was it. I walked away that night and didn’t look back. Overcoming that pain was slow but steady. I stuck to the below process and I rose from the ashes into a stronger woman. I remember one of the first things I did when I broke up with Mr. X was call my Aunt. I knew that she had gone through a really hard time in her love life when she was in her 20’s and I was desperate to hear her story. I went to visit with her for an afternoon and asked her to tell me how she got through it. She encouraged me that I was healthier than most girls in my shoes and that I would make it through in just a matter of time. She hugged me and reassured me. She was a great light to me on a dark day. Reach out to those in your life who have been where you are, they are there to light your way. They say it takes 21 days to form a new habit. Whether you realize it or not, when you were in your relationship you developed some habits that centered around the other person. Life rhythms that either mirrored your partner’s hobbies or perhaps even habits based on things you both enjoyed doing. A great practical step you can do to get over the heartache you feel is to stop doing what you used to do with that person and start doing some new things based on what you enjoy. Undoubtedly you have found yourself with an overwhelming amount of free time now that you are single and that alone time can serve as an ominous opportunity for far too much unhealthy introspection. If you’re not careful you can end up focusing it all on what you might have done wrong or how you could have done things differently to save the relationship. None of this is helpful. Instead, fill that time with new habits that will nurse yourself back to emotional health and strength. The best way to do that is to replace the old habits with something else. For example, if you used to text your partner first thing in the morning, maybe your new habit is to find an Instagram account of inspirational quotes to follow and check that first thing when you wake up. Maybe you pick up a book to read before going to bed to replace that good night text you used to habitually send. When you get ready for school or work, listen to a podcast that will motivate you or soothe you. I replaced my old habit of calling my boyfriend first thing in the morning with reading my Bible first thing in the morning, because that was the only thing that really soothed my soul. I would actually go to sleep with it on my chest so I reached for it first thing when I woke up. I spent a lot of time reading the book of Psalms because King David wrote so many of the Psalms from a place of brokenness that I felt truly understood and comforted by God when I read them. 80’s Movies like “Better Off Dead” were really good at demonstrating the trauma of a broken heart, even down to the scene where John Cusack is driving his car and changing the radio stations but cannot seem to get away from the love songs. When you’re going through a breakup, your emotions are hyper sensitive. I’d even go as far as to say that you feel raw inside, so things like love songs that would normally be no big deal all of a sudden have a tremendous impact on your emotions. Steer clear of them for a while. But don’t avoid music altogether. Create a playlist that is expertly curated with old music you used to listen to before you met or new music that uplifts and motivates you to keep going. Destiny’s Child “I’m a Survivor” is a classic one, from before Beyoncé became a household name. And it was my go-to anthem. You can listen to it here. It’s likely that while you were in a relationship you let many of your passions fall by the wayside in favor of spending time with your partner. Time to resurrect those. Use those newfound hours and channel them for your life’s biggest passion points. What do you love to do? For me that was running, writing and acting. I threw myself into training for a marathon and I ran every morning at 5am. I took an acting course at my local community college. I auditioned for community theater and performed in a play. I wrote poetry and songs to express my pain and give myself hope. One of my friends who was a singer actually sang and produced one of my songs. It’s called No Insurance. You can listen to it here if you’re interested. I hope it comforts you. One of the ways I filled my time was in volunteering. I discovered the greatest joy in helping out with Big Brothers and Big Sisters of Los Angeles. It not only exposed me to a new tribe of people but playing football with those kids every Saturday morning and mentoring a little sister after school during the week brought me so much happiness. I realized I didn’t think about myself once while I was with them. In focusing on others, I forgot about my own pain. 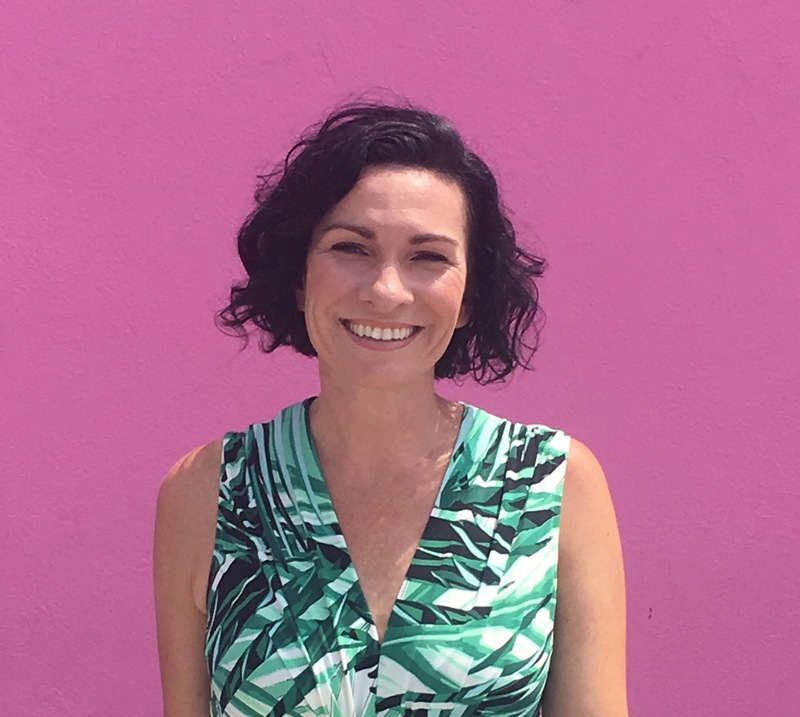 I poured so much time into Big Brothers and Big Sisters that I ended up getting “Big Sister of the Year Award” for the city of Los Angeles, which was ironic because I felt like I should have given them an award for saving me from myself. I remember the scariest thing about being broken hearted was being left alone. I did not want to spend any time alone because I was so desperately afraid. When your mind is in that state, the best thing you can do to thwart the fear of being alone is to hang out with friends. I had spent so much time with Mr. X that I didn’t really have any friends when we broke up, so I had to make new ones. Being an introvert, it is not easy for me to make friends but I found a small group at my local church and began going faithfully to it every week. I built some of the greatest friendships of my life in that small group, people that I am still friends with today, not to mention meeting my future husband through it, but that’s a story for another time. If you’re not part of a church, there are lots of meet-ups online that I didn’t have access to back then. The important thing though is to find a squad that you can connect with, laugh with and grow with. The one piece of advice I hated hearing but held truest was that time heals all wounds. I wanted to know how much time it was going to take. How long would I wake up every morning feeling sick to my stomach and go to sleep every night feeling afraid. How long would I be alone? Would I ever find someone to love me, truly? These fears were real and I wanted to be able to look at a calendar and circle a date to look forward to when the nightmare would be all over. But there was no such solution provided for me. In fact, it was quite the opposite, I remember 6 months passing by and still feeling heartsick and one of my friends saying to me “aren’t you over him yet?”. I wanted to yell back at her with her perfect husband and family and career and say “NO! LEAVE ME ALONE!”. But people who have not gone through heartbreak cannot comprehend the pain of it. You cannot put a time limit on it or a time estimate for when it will go away. But you can know that it WILL go away in time. My dysfunctional relationship lasted 5 long years and it took me a good 18 months to finally be free of it, but it’s different for everyone. Don’t feel like it is going to take you that long. I have high hopes for you to overcome much sooner than I did. I just kept believing that I would not lack my mate. That God’s Spirit would someday bring the right man to me. That faith sustained me through so much pain. And God did bring me the right man two years later. One of the biggest lessons I took away from my bad relationship was finding out what I really wanted (and didn’t want) in a man. I decided to use those learnings to formulate a list for a man. I called it my “Man List” and it was super detailed and specific but I felt free to dream about what I really wanted instead of what I had settled for. Don’t be afraid to DREAM BIG and write it down! The only form of social media we had available during my breakup was email (thank God) so this last one is actually something I neglected to do but should have done. I did not block Mr. X’s email as spam and I should have. I can remember getting an email from him a full year after we had broken up and it totally messed with my nervous system. Just seeing his name in my inbox at work sent me into a panic, I had stomach pains, I was shaking inside and after reading his email began to cry. AT WORK. This may be the hardest thing you will have to do because it seems so harsh in today’s society but you’ve got to purge your social sphere of any reminders of your past relationship, at least until you’ve moved on. That means unfollowing your X, his friends, his family and associates. If there are mutual friends you have that could end up surfacing his content in social media, then unfollow them as well. The reason being, that when you are in the broken stage, even the sight of his or her name can be enough to send you into an emotional panic. Do yourself a favor and unfollow. If this step is too difficult then I would suggest abstaining from social media altogether until you’re over it. You will get through this. The pain you feel right now is so hard, I know, but it will go away in time. The fear you are feeling will subside and you will rise. I am living proof of that.